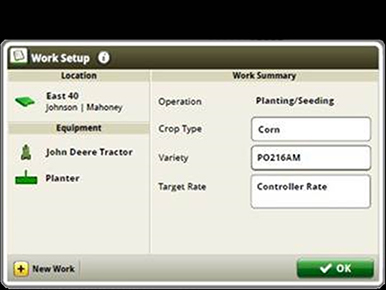 Central Commodity System (CCS) seed delivery adds productivity through increased seed capacity, bulk fill capability and easy, thorough cleanout. 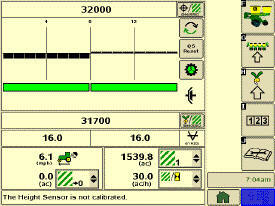 The two tanks have a combined capacity of 100 bu on the 1720 CCS Planters. 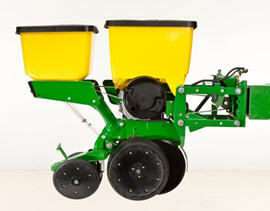 The 1720 CCS Planters have been designed to allow for a convenient, central filling location and easy cleanout. 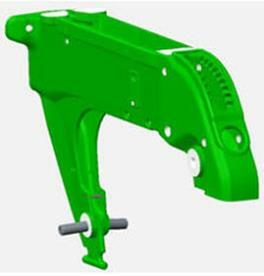 The rear entry ladder provides access to the filling platform between the tanks. 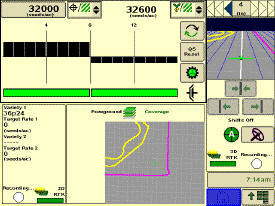 For those who work into the night, a fill light package is standard on machines equipped with CCS. 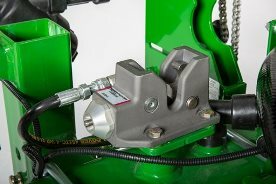 If your seed carrying vehicle requires hydraulic power to run the unloading system, the auxiliary hydraulic coupler option can be ordered. 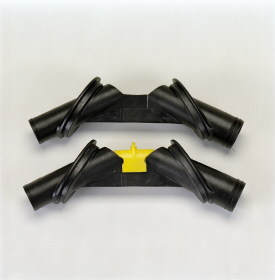 These couplers are located at the bottom of the staircase and can be coupled under pressure. 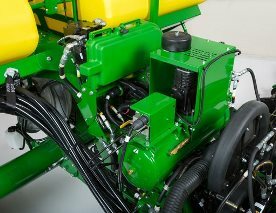 The system has a separate system filter that ensures your planter hydraulic system remains free of contaminates. 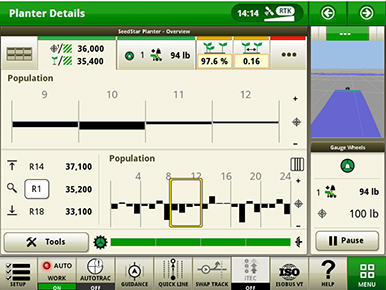 CCS is about reducing the time spent filling the planter with seed while maximizing the time spent planting. 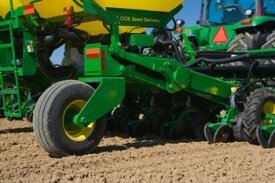 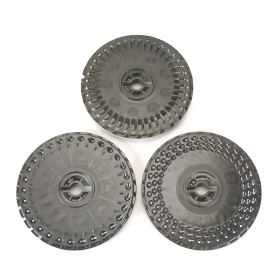 CCS for planters is a form of seed handling and delivery. 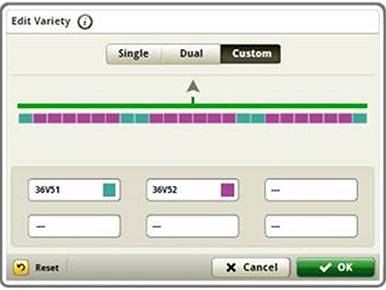 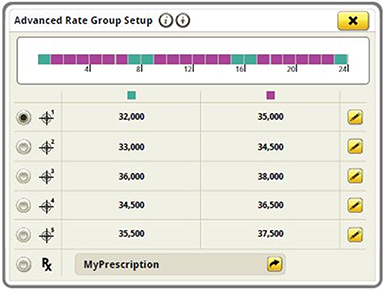 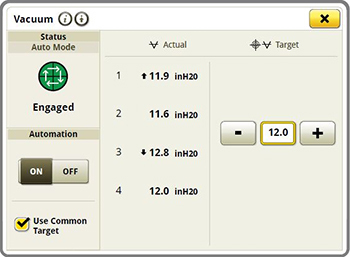 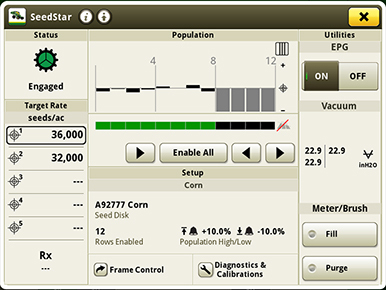 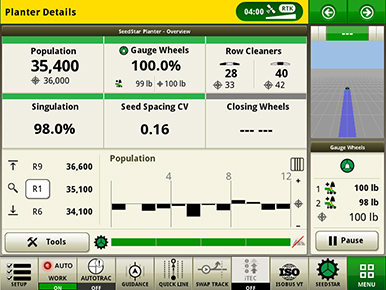 The row units perform the final task of seed metering and placement. 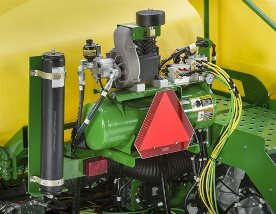 The CCS seed delivery process relies on a hydraulically-driven fan to move seed from the CCS tanks to the row units. 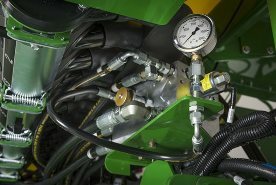 A flow control valve and gauge, located near the tank, allows for the proper tank pressure setting based on seed type. 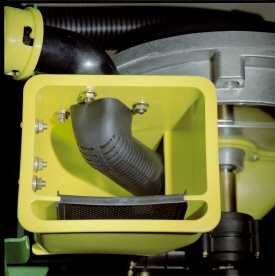 Air from the fan pressurizes the CCS tanks and delivers seed to the seed hoppers. 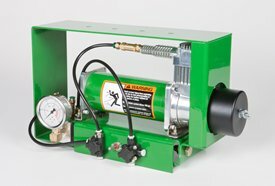 Air flow enters the seed tanks through a nozzle in the manifold which pressurizes the tank. 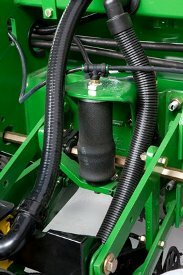 The air then picks up seed and moves out the other end of the nozzle into seed delivery hoses. 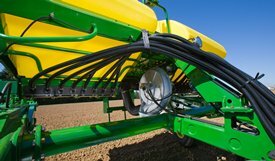 These hoses route the seed toward the hopper. 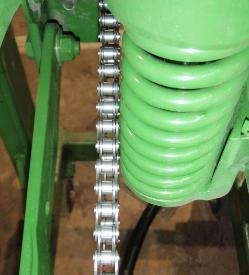 A small amount of seed is traveling in the delivery hoses only when needed. 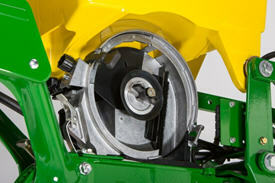 The hopper fills with seed until the delivery hose (discharge elbow) is covered. 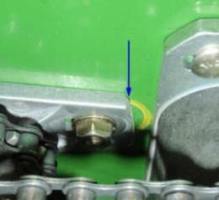 Once the opening is restricted, seed flow through the hose stops. 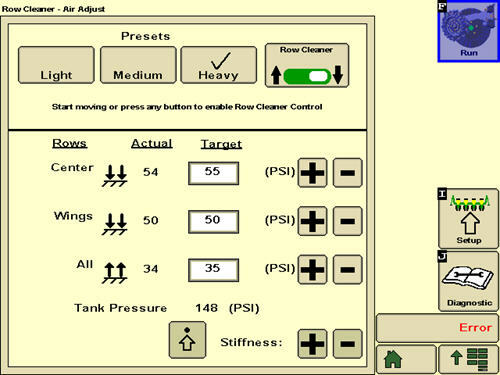 Air flowing to the row unit travels into the hopper and out through a vent. 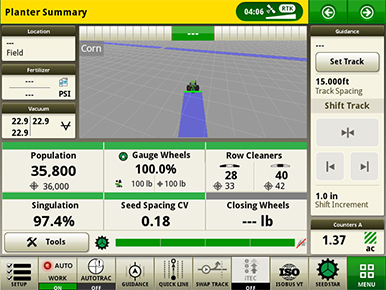 As the seed is picked up by the meter and planted, the seed pool shrinks until the end of the delivery hose is uncovered. 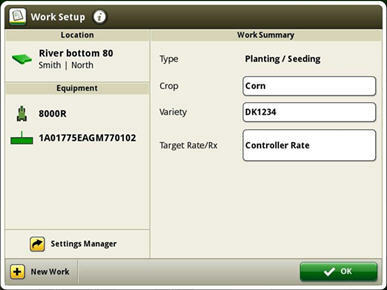 At that time, the air flow and seed delivery resume, and the seed pool in the hopper is replenished. 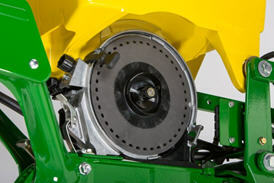 Seed cleanout could not be much easier with a CCS Planter. 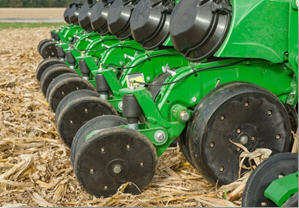 Whether there are 12 or 48 rows, the CCS system and Pro-Series XP™ row units make quick work of this chore. 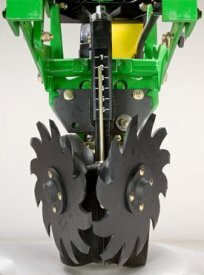 When finished planting any remaining seed can simply be removed via access doors at the bottom of the CCS tank. 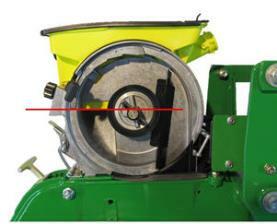 Lastly, the vacuum meter door is opened and seed is removed with the supplied catch pan. 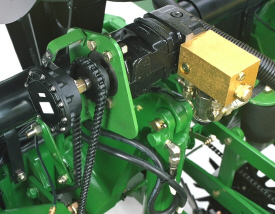 Manifold nozzle covers (clips) should be installed to ensure seed is adequately picked up into the air stream for delivery to the row unit. 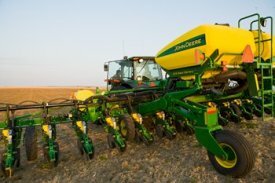 Mini-hopper discharge elbows should also be changed from the standard elbow (holes) to the small seed elbow (slotted openings) when planting sorghum (milo) and small cotton. 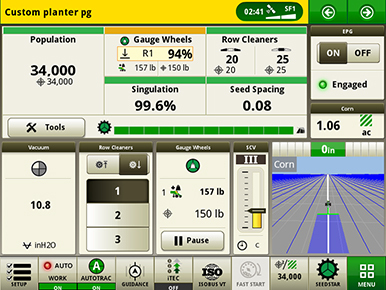 As planters get larger and more customizable, there is more weight being carried by the center mainframe. 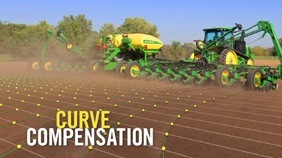 This presents the possibility that weight may not be distributed evenly along the width of the planter frame during planting in certain circumstances. 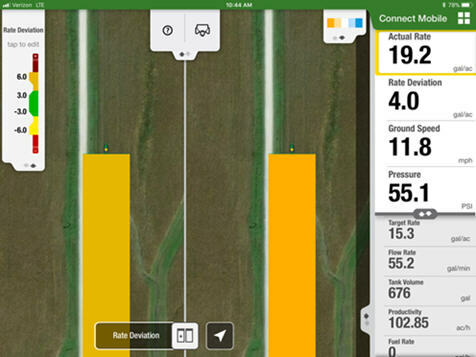 Some studies have shown there could be a potential yield loss of 2 bu. 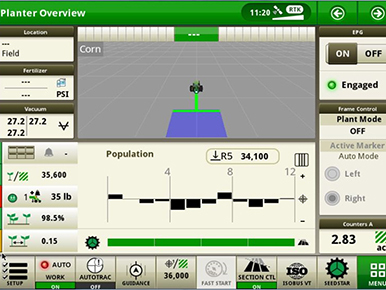 per acre in certain soil conditions from unequal weight distribution with more weight being on the center of the planter. 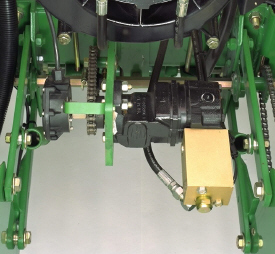 The option has been added to have hydraulic cylinders mounted on to the frame of the planter that redistribute weight from the center of the planter to the rest of the tool bar. 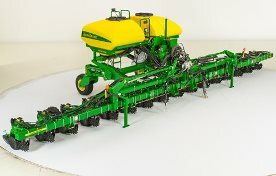 Available on the following models: 24Row30 1775NT and all DB60. 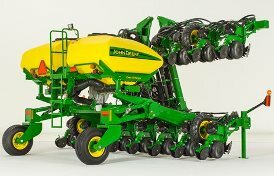 The 1725 Stack-Fold design provides narrow transport capability for these integral, large-frame planters. 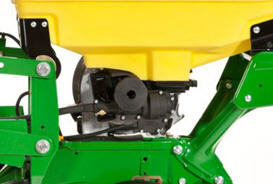 1725 Stack-Fold Planters have the ability to operate in both rigid-frame and flex-frame configurations. 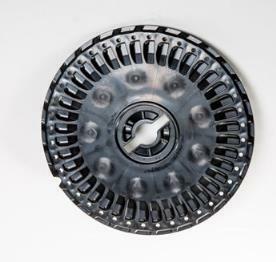 The 1725 CCS utilizes a three-section frame that can flex up to 10 degrees up and 7 degrees down. 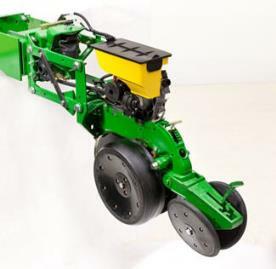 The 1725 CCS Stack-Fold Integral Planter is available in the following configuration: 16Row30, 12x2 T.
Heavy-duty, lift-assist wheels are integrated into the 1725 CCS frame design. 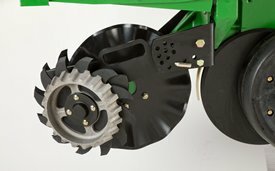 The CCS cradle is supported by the heavy-duty, lift-assist wheels which reduce the amount of weight placed on the rear of the tractor. 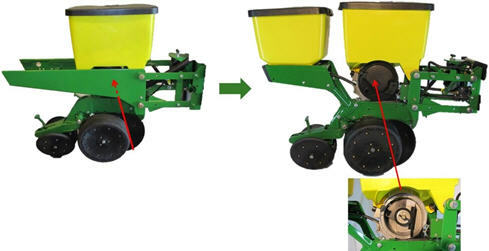 This design provides a balanced planter for maneuverability in the field and during transport. 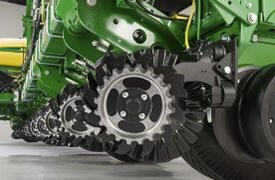 The 1725T CCS has larger 16.5L-16.1SL lift-assist wheel tires to provide additional floatation in a variety of soils. 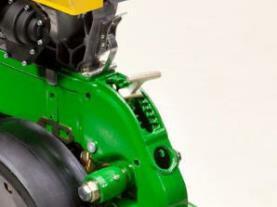 Hydraulic steering is available on the 1725T Planter to guide the planter when the tractor is in reverse. 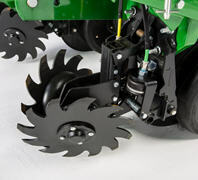 This is useful during headland turns to keep the lift-assist wheels from castering or spinning around while backing to the next pass. 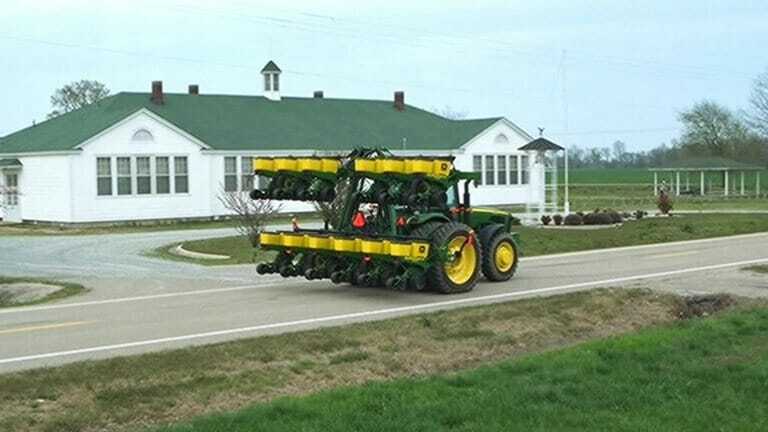 The vacuum is run through the planter frame rather than the black conduit on top of the frame. 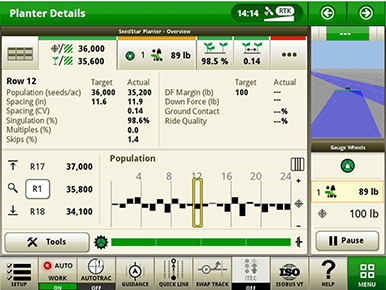 This provides many benefits to operators. 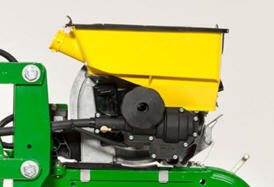 The frame is cleaner and provides improved visibility when seated in the cab. 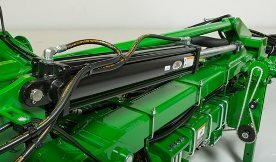 The frame vacuum lines give increased durability for optimal vacuum performance. 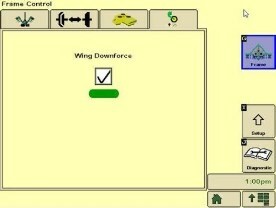 Wing downforce has been added to the 1725 CCS 16Row30 with ExactEmerge. 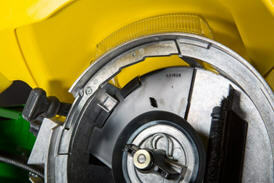 When traveling above speeds of (8.05 km/h (5 mph), the wings become lighter, sacrificing ride quality and consistent depth. 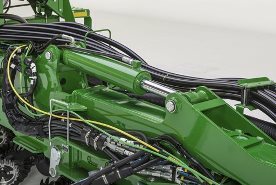 Hydraulic cylinders have been added that transfer weight from the centerframe to the outside wings to maintain consistent weight distribution and provide operators with their desired depth control. 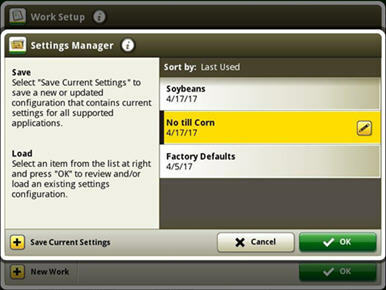 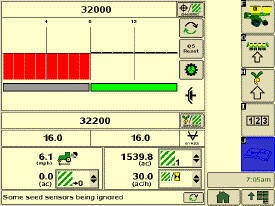 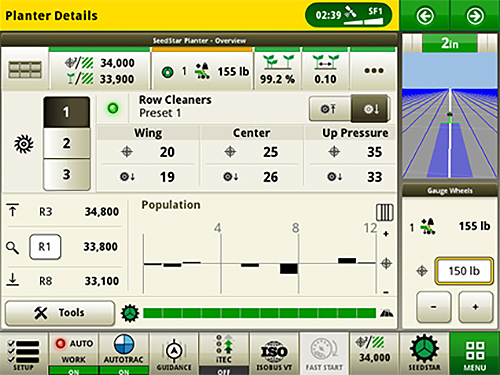 Active pneumatic downforce is now offered in conjunction with the ExactEmerge option codes on the 1725 CCS 16Row30 model. 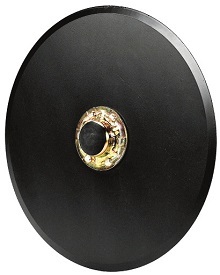 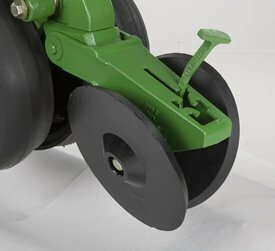 This provides the proven solution for growers to maintain consistent depth even at speeds up to 16.1 km/h (10 mph). 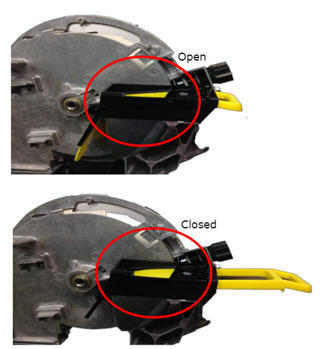 See the active pneumatic downforce page for more info. 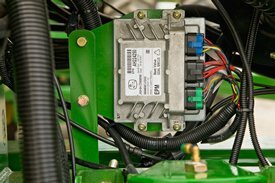 An automatic hydraulic-wing locking feature is now available on the 1725 CCS Planter Once the operator engages the frame-fold selective control valve (SCV), the hydraulics release the locking mechanism and the planter starts folding. 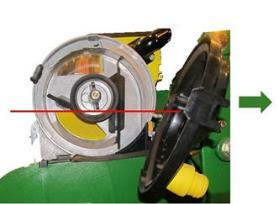 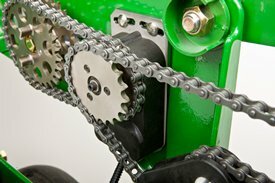 This reduces trips up and down the tractor and provides for a much quicker process in and out of the field.